This rug is beautiful!! The colors are so vibrant and more beautiful in person. Nice size and quality and perfect for our newly finished living room! This rug is beautiful. The background color is a soft gray, and the other colors are so vibrant and pop! I use it under the dining room table and it works wonderfully.It is with great quality, would definitely recommend. Carpet is AMAZING!!! The colors pop!! This new addition to our living room is so pretty! I choose these colors as we have one room with coral, one of blues and one of purples. 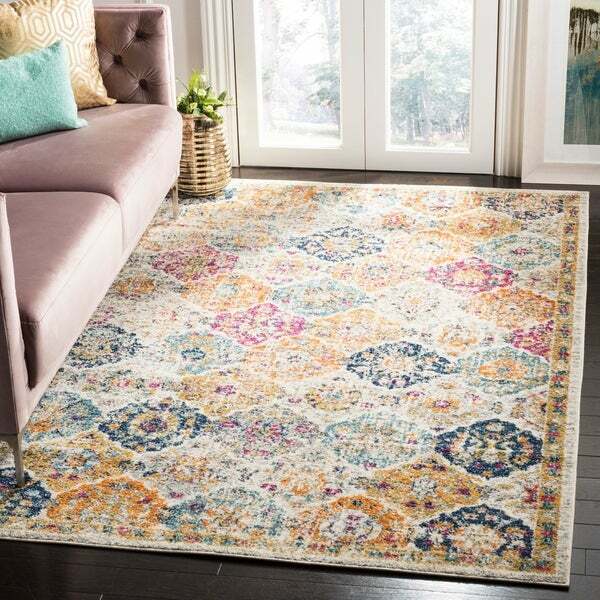 Having this beautiful carpet with multi colors in it, pulls together from all the colors of a the bedrooms and displays a little bit of each in one rug. The rug fits perfectly as well I am very surprised and happy with the quality of the rug. The thickness of the carpet is perfect. I did not purchase the padding for under it and so far it is remaining in place. I do have some furniture that sets towards the corners of the carpet so for our home, this works beautifully! The carpet did have a odor when I unrolled it big it did not last and went away after being laid out for approximately 2 hours. Again I am very, very pleased with the carpet and cannot wait for the matching runner to arrive for the hallway. Great purchase !!! This rug is just as it appears in the photos online. Colors are true, vintage look distressing is true and the quality is top notch. The fun colors go with just about everything and bring a fun element to the room. This was the second rug by Safavieh and both have not disappointed. I would recommend using a rug pad with it. Fabulous rug that’s even more gorgeous in person!! Thrilled with this beautiful rug!! I’ve ordered from Overstock.com a few times and have always been happy with the purchase. I’ll definitely be ordering again soon!! This rug is beautiful. The colors are vibrant and cheery. Great size, great price. One thing to know is that the rose color is a tues bright, deeper pink. This rug would look beautiful in any space where you want to add a bit of sunshine. This was a great buy! Nice quality and colors are as pictured. The aged look subdued the colors enough to where it isn’t overpowing but still colorful. The price for the size of the rug is amazing, I’ve been shopping rugs for a long time and this was by far the best deal I have come across, very happy! It also was delivered extremely fast, I think it was here by Monday when orderd on Saturday evening. 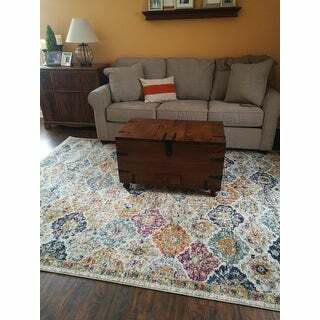 Great rug, versatile and matches a lot of different decor. It’s comfortable to walk in and unique size was exactly what I was looking for. Delivered super fast and good price as well! Love that the colors are not over powering. I like the low pile works great on top of my bedroom carpet. The 6 x 9 is the perfect size for under my bed. Amazing rug! I get compliments all the time! It is a little thin, so you will need a rug pad under it for comfort. Bright Colors are Blue, Yellow and Pinks mainly. This is a beautiful rug and the colors are gorgeous! So many possibilities to mix and match with this. I am using grays and teals. And, the price was great! Overstock never dissapoints. This rug is a great quality. We weren't expecting so much as the price was so low. It looks like a much, much more expensive rug. The colors are so soft that they blend with just about anything. WE LOVE IT!! 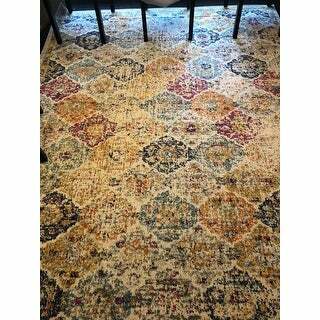 Lovely rug in muted colors! I love the colors in this rug! It goes with really anything! None of the colors are overbearing - they just mix and mingle in a way that will make this rug go with anything! Ties my living room furniture together - easy to vacuum. Perfect! 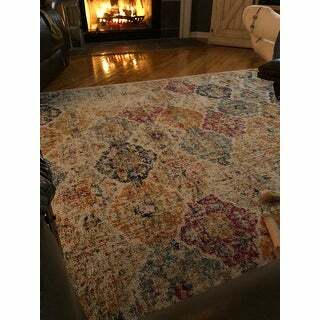 This rug is absolutely beautiful the colors are wonderful and match exactly what I was looking for. I had requested to have this delivered to my office address. It was incorrectly delivered to my home address. Looks great and is quite big. I had to get pads for the smaller rugs and will probably need to do it for this as well even though the corners are under a sofa. But that is the only negative. My 80 pound puppy loves it! "Is there any grey in the rug?" Yes there are grey shades in the design and border of this rug. Please note colors may vary due to dye lot variance in production.
" 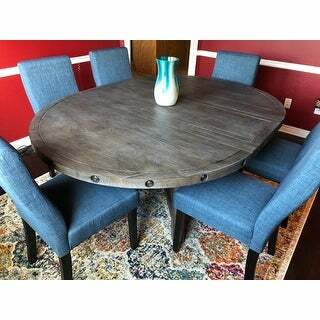 Can anyone tell me the true measurements for this rug ?thank you "
Rug Size: 6' x 9'. I hope it helps. Mine measures exactly 112" x 78 3/4". "Does this rug have any teal in it?" It has various blues in it including different shades of a teal/turquoise and a weathered navy blue. "What are the various colors of this rug? Thank you." the colors are more muted than the picture. They are all true to the picture also, but the red is pink. So if that's a problem, know that, but otherwise, very pretty! "Is the "red" color more pink than red? I have deep red accents in the room." Mine is magenta not a lot of the color in but it shows up. I think they are all a bit different. Wanted a subtle color rug for my 3 season room.